There is train classes for everyone. The backpacker who wants to travel cheaply and well, usually buy Second Class Sleeper (II Slepeer). They are simple lits cover with sintetic blue leather , which are usually reasonably clean (or with a cloth and clean water in zero point seconds). the open conpartiments holdes 6 lits (no doors and merge with the corridor). It's the kind where travel all Indian middle class families workers, many families with lovely children and the grandpas´. It's a very nice way to meet people from India (in First Class are more unfriendly). Second Sleeper is almost always full so you need to book as soon as possible on the train station (free reservation), at an tourist agency or you may buy it online and print your ticket (agency usually charge a 20 rupees to the Indians and 50 foreigners, most is a scam), if they ask if you want RAC, is worse but go (side smaller berths, sometimes holds 2 people so you will travel sit). It is very common that the Indians will purchase tickets and then cancel the last day (they returned almost the entire amount, same for you too if needed), so tickets are sold "waiting list" as many as are sold (people will sit in the hallway or landings). Overall a waiting list number less than 30 has almost secured site (when you get to the station the day, the train, go to the tabloids to see if you have assigned a bunk bed). You can always buy on waiting list which entitles you to travel but not to a seat, only recommended if you travel during the day, of course. In the bus there is usually no problem to book (only in the mountains), where there is a train from one city to another usually are 5 or 6 buses a day. Just go one or two hours before departure and there is usually no problem to get a seat (except in the mountains insist), the buses are somewhat slower and travel through crowded roads, opposite the train goes by the more rural landscapes, nicer and cleaner. There are different types of bus, but I like the regular state buses with sintetic seats and windows open compared to private buses "deluxe" dusty and with fixed windows that do not open . There are deluxe gov. buses. Gov buses are driven by the safer and best drivers (they get better salaries, more resting time, and mechanical of the buses are check and fixed usually in compare with private). The bus is good choice for trips less than 5 hours. For longer routes Train is a thousand times more comfortable and has WC (clean at the departure, dirty after 4 hours, stinky at the end). At each station you can jump off the train to the platform: to get water, biscuits, cookies, seasonal fruits, and fried samosas or other food served in wheal carts or small station stalls (more people queue saffer maybe the place), I should not forget the Chai (tea) and light coffee (also the train all the time). 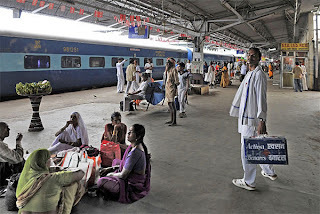 Some train lines offer food (thali) in trays on the way by the official catering, someone dress in official red clothes covers the train with a notepad taking the demands, The is carried up the next stations and is brought to you the time promised (rare in India). 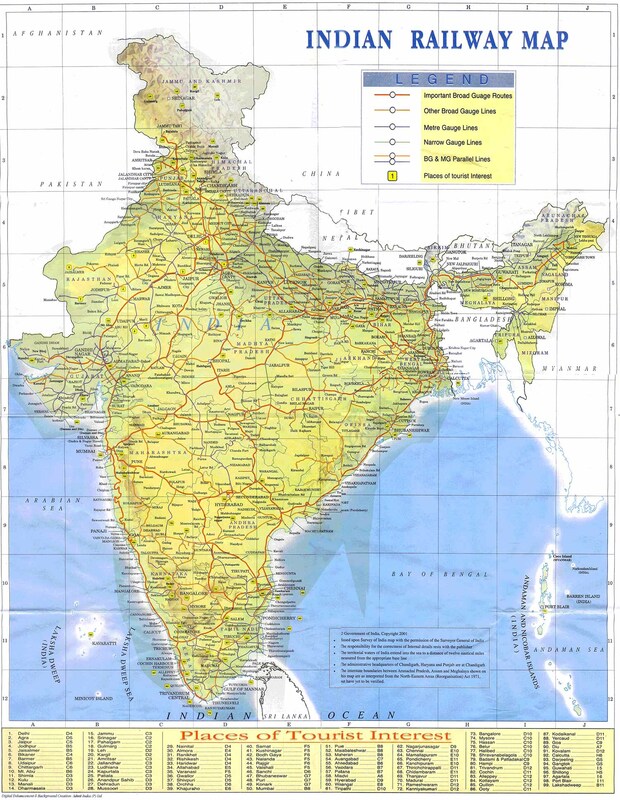 You must realize the train is the only thing that works really well in India compared to anything else (trains depart from the first stations on time, delaying after a night journey usually arrive between 1 and 3 hours later, so be careful with the connections). The train stations are a world in itself, one could take a tour into Indian train network without leaving the stations: You have food, toilets, showers, book and press stalls, dorms (men only) and double rooms in large cities stations (mandatory carrying the travel ticket to sleep until 2 nights at the station after the arrival). Trains run many times in the night, so it's not uncommon to see people sleeping on the floor waiting for their train. Throw down your blanket, Candán the radiator or bank suitcase and sleep (middle and lower classes even backpackers ;). Those who travel in II Sleeper have a "waiting room" with wc (sometimes even showers, and they are clean! More than once I've taken a cold shower , I've changed my dusty clothes, and I was renewd and ready to seek for a room or see the city). There are waiting room for men and another for women, women can stay in the men but not the other, there is also a waiting room for first class (not much better but there are less people). You can leave your heaby bag at the locker room at the station (mandatory showing train ticket and passport) for about 10 rupees a day. You can get off the train, give you a little shower, eat breakfast, leave the backpack in the luggage (baggage locker) go to see the city and return in the afternoon to take another train and keep traveling, be sure of the closing times of the looker room. If the weather is warm or just litle hot, do not hesitate to go in II Sleeper (good, nice and cheap). Buy a chain (usually have at the station stalls or in the vicinity of the station) and a padlock. On the lower bunk, under the seat, there are iron rings for chain your backpack or suitcase. I also recommend to tie your shoes with a couple of knots to your backpack and hide them under it (many people get up in the morning without shoes!). There are travelers that take them up to the lit, that India is an intolerable lack of hygiene and uneducation . -II and I Class seated: only on day trips. -The last class is the working class, Third class was called but the Indian government removed the name. It's the class that Gandhi used to travel. Now called "General class". It consist of wooden benches and iron bars above to drop our bags, many Indians put a blanket on the bars and lie down to sleep, even when the train is crowded and the bags do not fit anywhere. No one will bother him, sleep is sacred in India. You should never morally and spiritually wake up someone who is sleeping. This class is for hippies and adventurous backpackers, a ticket can be buy just an hour before the train leaves only for general class (you get a carton ticket), and are sold as many as people want to travell. So if train goes empty you will travel in General class seated and decently well, but offen there are crowds of people and you will not even be able to get into the wagon, and you will loose your trip. In religious holidays certainly goes more than full. In old times, climbing to the roof of the wagon in general class was an option, but it's super dangerous (cables, tunnels, slip) and is now banned (the pictures you see of Indians on the roofs of the trains are from Pakistan and Bangladesh or from India 30 years ago). I just recommend this class to very short day trips last no more than 4 hours, take some pillow with you to lay under your bottom (wooden seat is quite uncomfortable ). also if no ticket in II Sleeper is available at all (even waiting list) or you arrive at the last minute to the station and you are forced to travel, you can try General class as a last resource and never on the night (I still recommend waiting list in II Sleeper even if you need to seat on the floor, before going on burst General class). General class costs half price than II Sleeper and the difference is huge!.Hope this helps. Train tickets must be booked at least 4 hours before departure, preferrable several days or weeks before, and I insist: always at least 4 hours prior to travel (otherwise only General class will be available). The cancellation policy is quite good (you get almost all money back even 4 hours before departure). 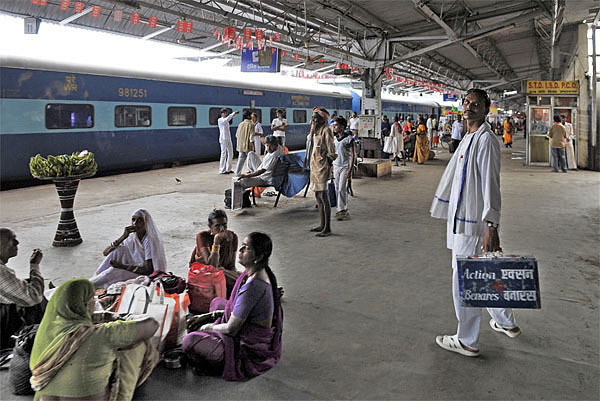 You can book in the same train station (get to the tourist window who tend to be more empty), some stations (first floor New Delhi, Jaipur, Varanasi) have a Tourist Reservation office. The best place to book all your tour, no doubt. But you must always know in advance what you want: starting station, departure time, train number and name (especially the train number is essential), arrival station. Available at the website of Indian Railways you can consult Trains at the glance. In station kiosks is also sold for 50 rupees the magazine Trains at Glance, it is better the publication that brings two maps, one colorfull map, the other with numbered lines (is the page where you have to look, much faster.) Do not forget to bring your passport and proof of having taken money from an ATM (automated teller machine) or exchanger bank office. You nned it to pay in Indian rupees cash. Otherwise you are obligued to pay in dollars. Also tickets can be purchased online at various sites (official is www.irctc.co.in/). It's messy, you have to register first, then when paying with a foreign visa seems you had some problems (choose Punjabi bank, ICIC or HDFC when paying choice).